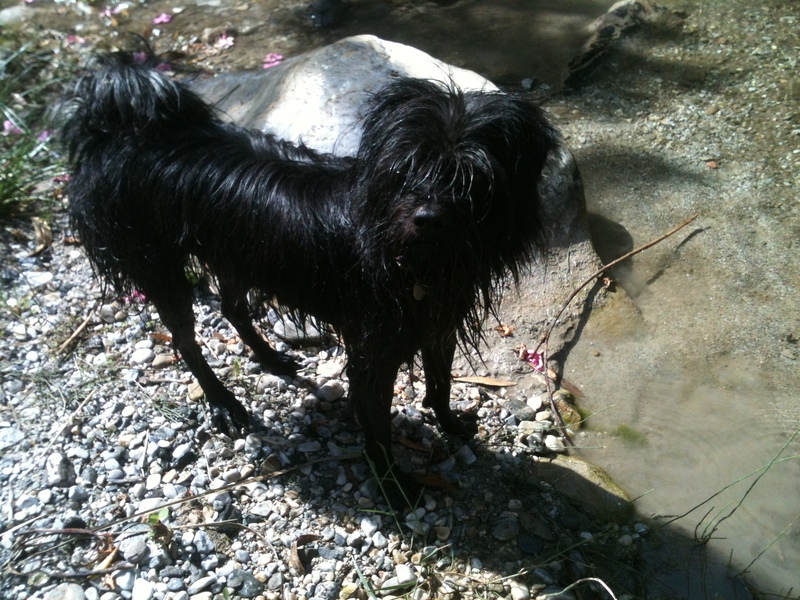 Today Liana, Roly and I took ourselves for a trip into the Canillas de Albaida valley, down to the river where we can usually find a bit of grass for Liana, although it is rather sparse at the moment. It is a fairly short excursion that we all enjoy. Roly loves playing in the water (the muddier the better) and I love sitting in the peaceful surroundings whilst the animals make the most of the shade of the oleander trees. The valley is full of these beautiful trees that are at their most colourful right now. They are completely poisonous and it is amazing that animals seem to know this instinctively. 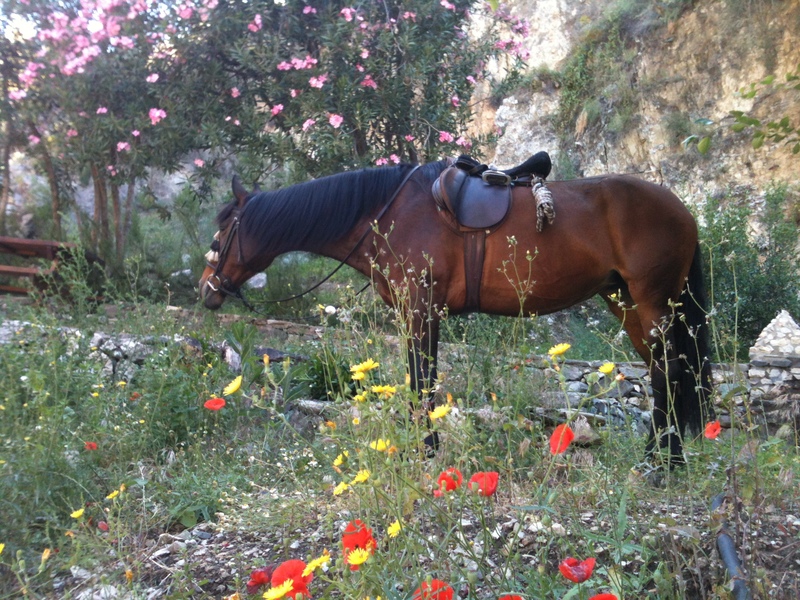 Liana is a very greedy horse, food is her number one priority and she will make a lunge for anything that looks even remotely edible, but she has never once turned her attention to the oleander. David phoned me as I was returning from my ride and suggested we meet in Ramon’s bar for a drink, which rounded off the morning very nicely. 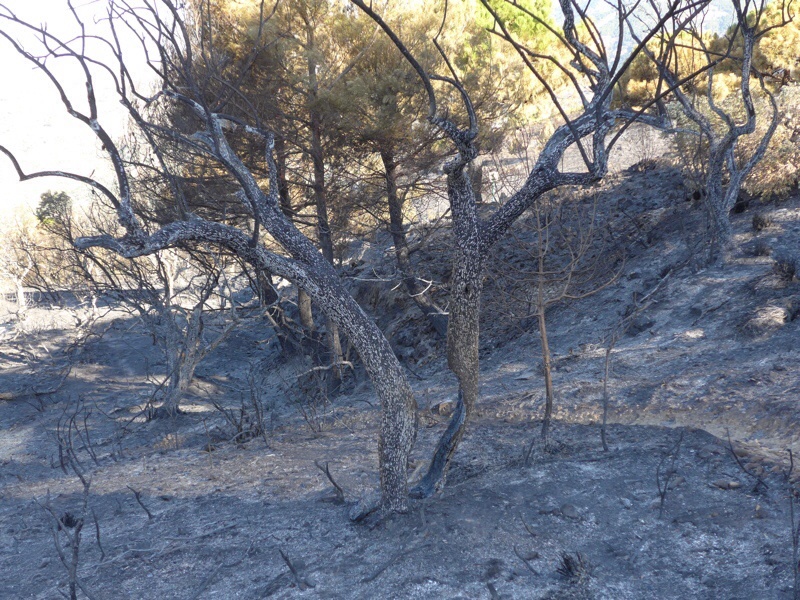 All this was in great contrast to walk Roly and I took yesterday, in the opposite direction, up into the natural park to take a look at the damage from the fire. 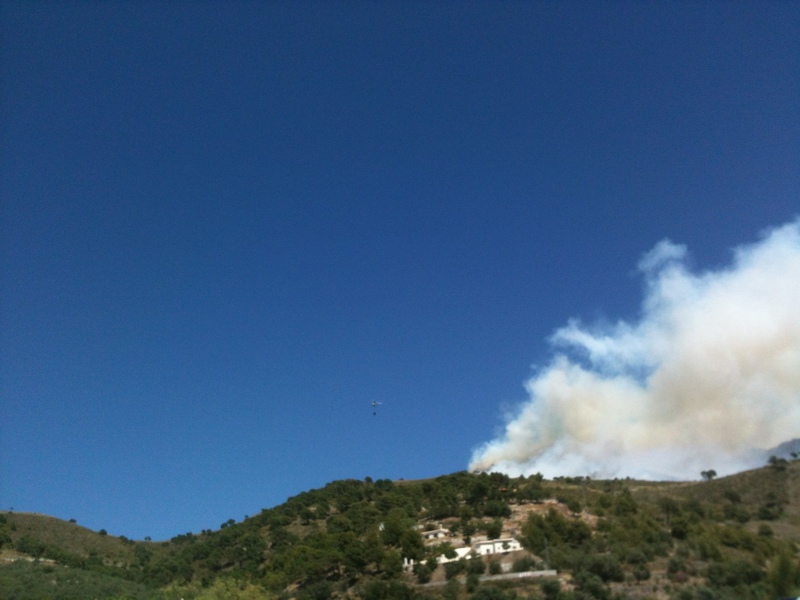 The first photo shows the fire raging up the ridge with our house in the foreground below. 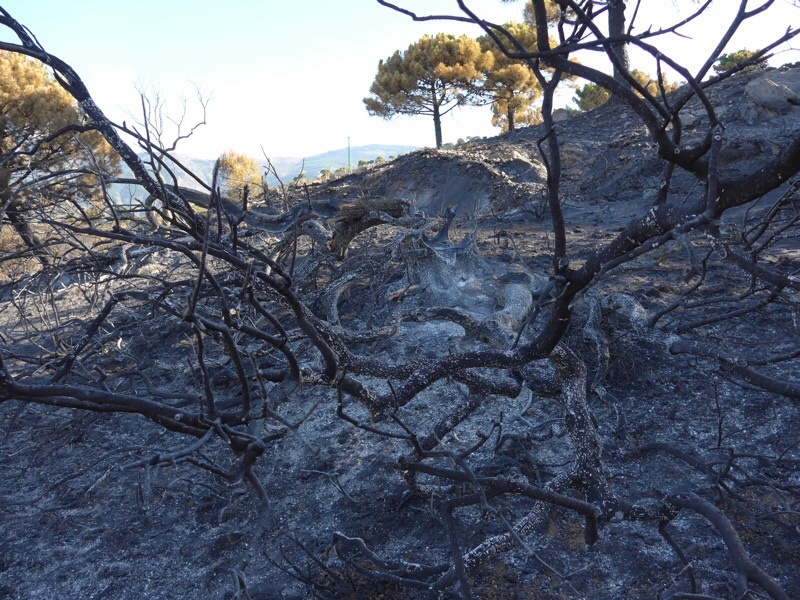 Luckily for us, the wind took the fire away from us towards Cómpeta. 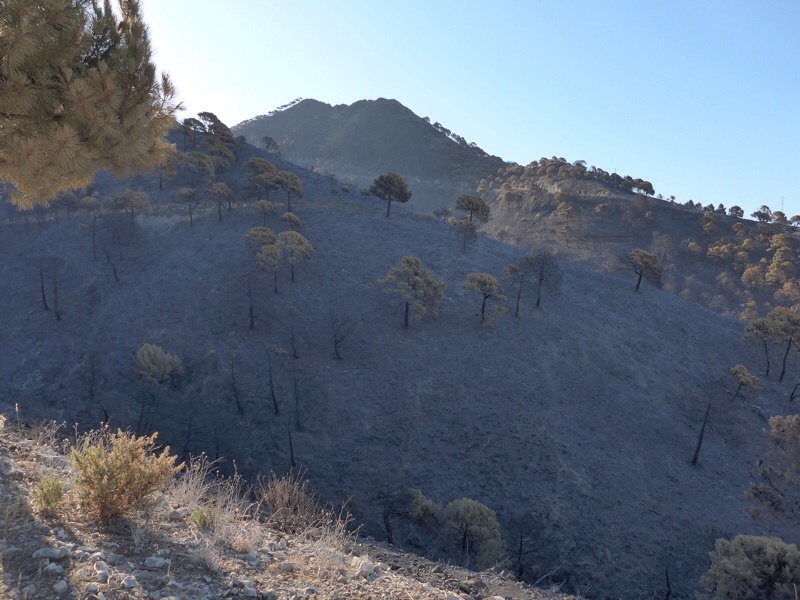 I discovered yesterday, as you can see from the second photo that absolutely everything on the other side of this ridge was ravaged by the fire whereas on our side the vegetation was totally untouched. A very narrow track divides these two areas, no more than 1.5 metres wide – incredible. This ridge rises directly from the Cómpeta to Canillas section of the goat track at the bend where there is often a mule kept. It rises to what I call ‘beehive corner’ as there are many hives close to the point where the second photo was taken, although I saw no sign of them – I hope the bees made a timely evacuation. Beehive ridge from another perspective. 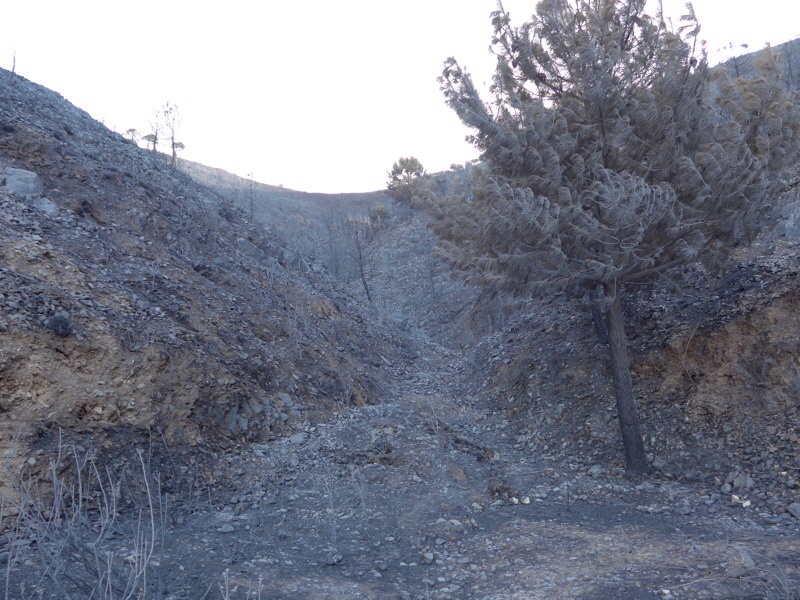 The other side of the ridge (where we live) was completely untouched. 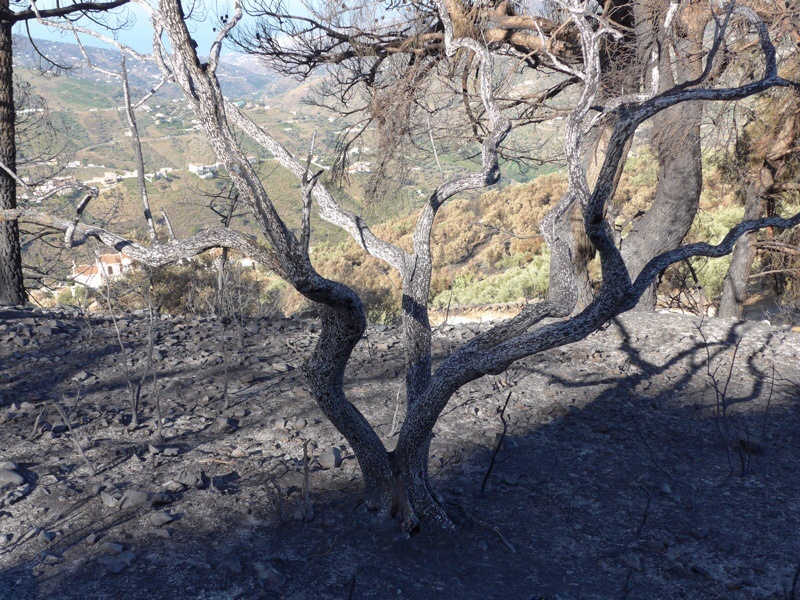 Looking from here in the direction of the fire hut above Casa de la Mina everything is destroyed – a vast area of charcoal coloured devastation. 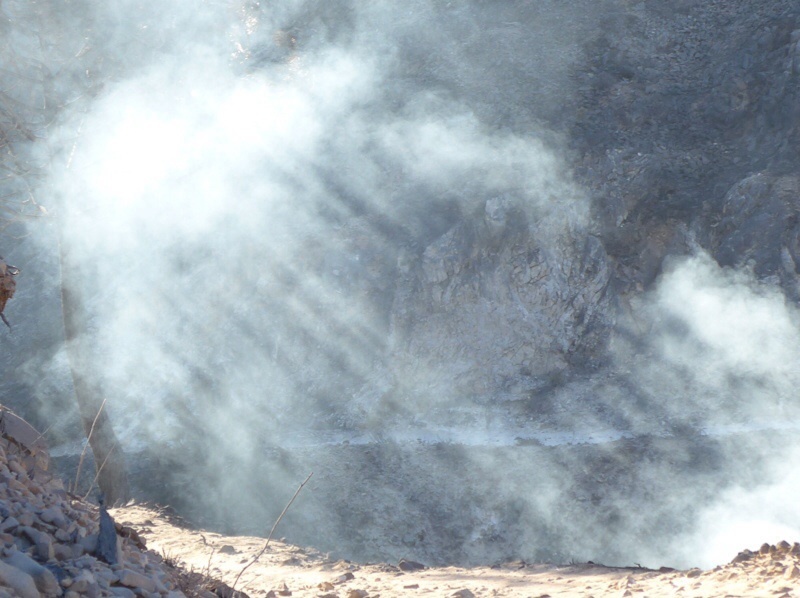 I even came across two places where the fire was still smouldering and sending up plumes of smoke, four days after the fire (Thursday). Below is a forward / backward duo at one of the gullies. 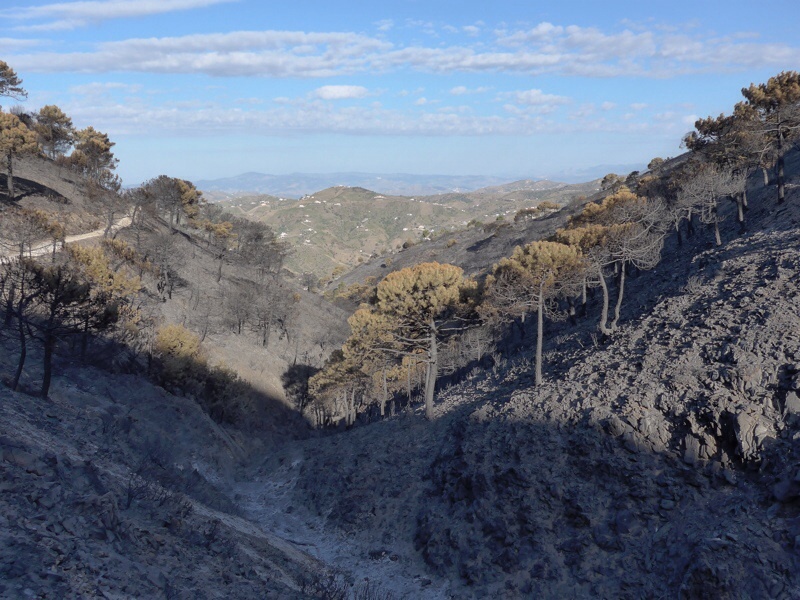 My friend Paco explained that the gullies act like chimneys, drawing the fire upward. 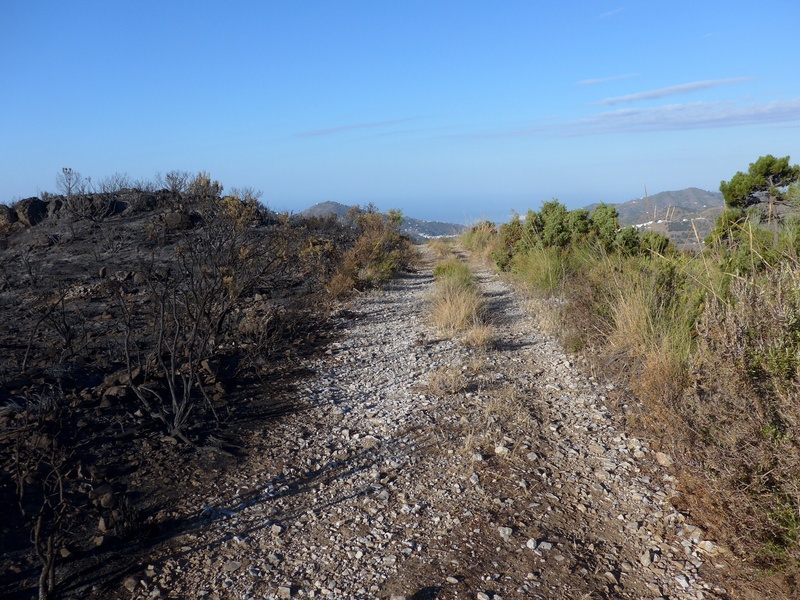 This part of the new GR249 walk through Malaga province villages and countryside will be a reminder for walkers of the dangers of carelessness. I started my descent through the olive groves at the back of Las Colmenillas, where many trees had been completely decimated, but some will probably live to produce olives in the future. 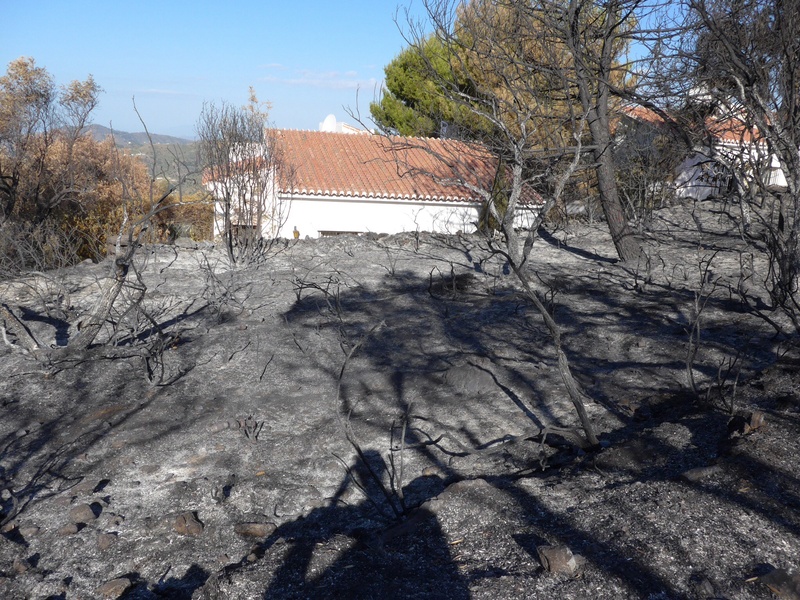 And finally a photo of a house in las Colmenillas with the fire coming to within a few feet of the property. We all have a great deal to thank our firefighters for. 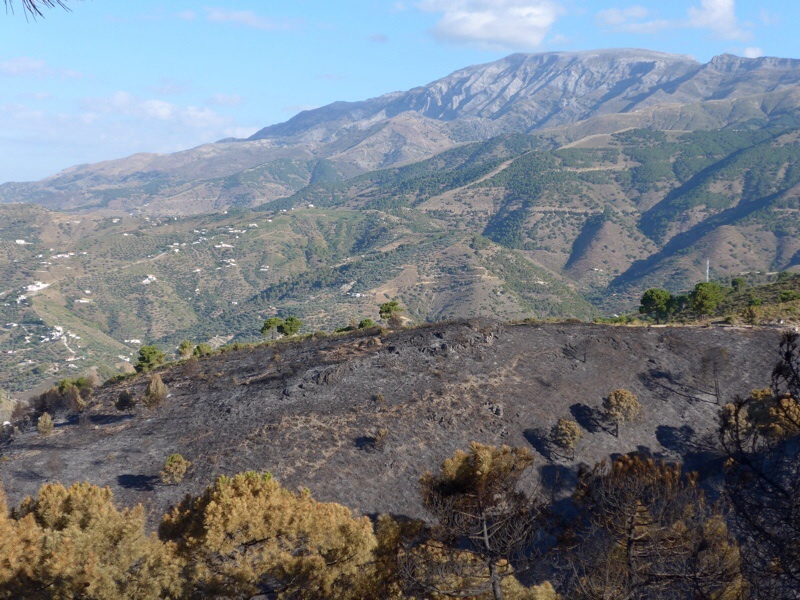 This entry was posted in A view of life, Animals, Expats in andalucia, Horse riding in the mountains of andalucia and tagged bombeiros, Canillas de Albaida, Cómpeta, Cómpeta fire, spanish firefighters. Bookmark the permalink. Hahaha …. Roly looks such a scallywag! 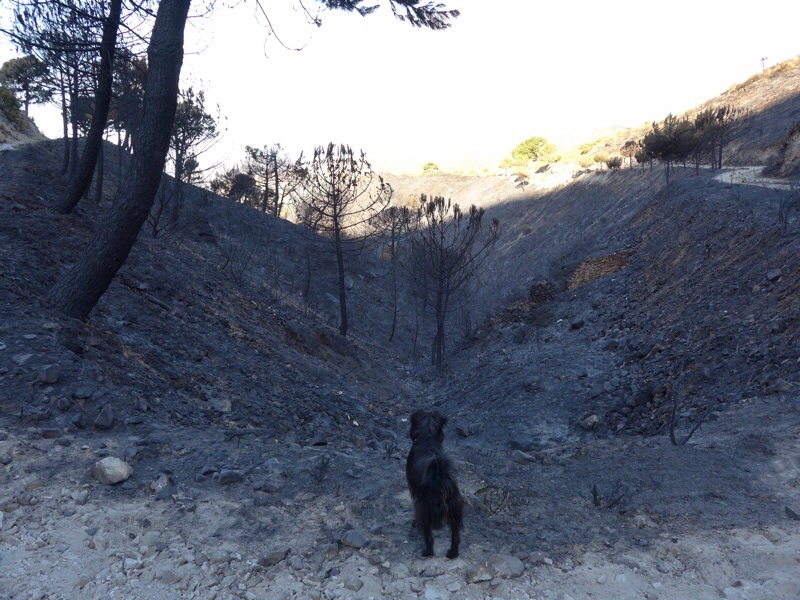 Great photos, Maggie – I’ve yet to go up there since the fire. I’m not really familiar with that area. Thanks Grania. It got right to the boundary wall of many properties and destroyed many gardens. Properties can be mended but gardens take years and years. The firefighters concentrated their efforts on protecting property first and foremost. Dreadful Jo, but Roly didn’t seem to worry about his surroundings being so very different. I wonder what was going through his tiny mind! I took liana into the park yesterday and she just seemed to be thinking ‘what have they done with all the grass’! Hi, Maggie, So many times I’ve thought about you since your return from the Camino Portugese. I’m training hard for my camino come Sept. My son and daughter-in-law will walk about 3 days with me,maybe as far as Leon, then to Madrid and back to Denver/children/work and life. I smiled at your commentary about riding your horse (beautiful animal, by the way, the picture shows she is well loved and cared for). I’ve ridden once in my life, then couldn’t move for a week after that, I think even my forehead and scalp were sore–and I live in Wyoming, real cowboy country!! Your pictures of the fire aftermath are awesome. After the awful fires in Yellowstone a few years ago, a few years later, the wild flowers for several years in the decimated areas were breathtaking. I sincerely hope that happens there too. Yellowstone is in the far northwest part of the state, I live in the lower sw part of the state >400 miles away and we could smell the smoke! Hi Leona. How lovely to be walking with your daughter and son in law. 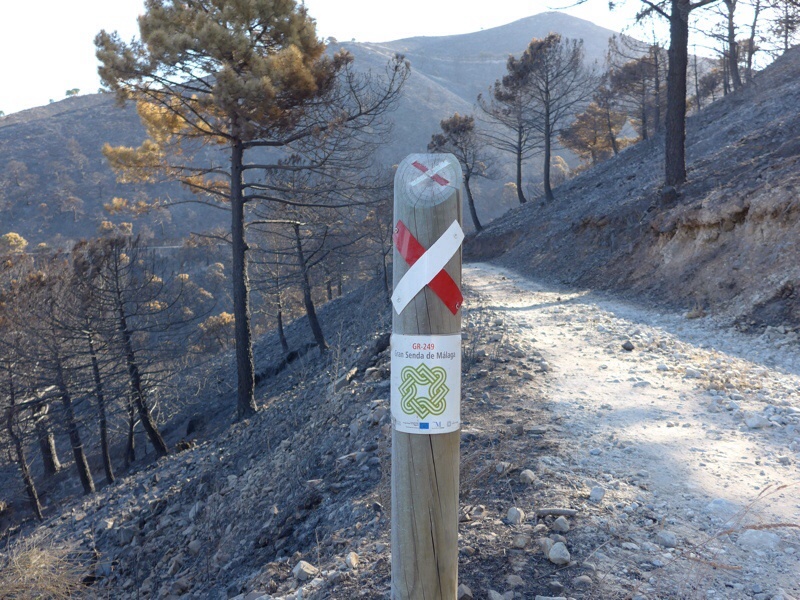 It will be a great way to start your camino. It is lovely to know something about you and where you are from, I feel I have made so many friends through the blog, but don’t know much about them, so every little helps! 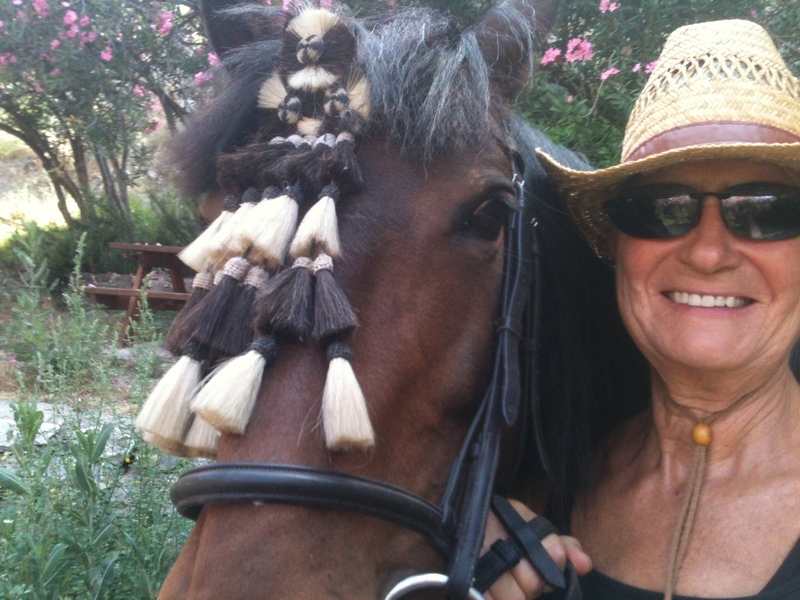 I would love to ride in cowboy country, flat land with grass – poor liana would think she had died and gone to heaven. It is beautiful here but not ideal riding country by any stretch of the imagination. And I love your comment about the spring flowers growing through the blackened hillsides. We have masses of beautiful flowers here and I can just picture them popping up next year – watch this space for photos. I hope you are enjoying your training walks, and getting your boots well and truly worn in. Are those flowering trees oleander? I am not a rider (nor have ever wanted to be, but I have a daughter who is one) but I can see the attraction in riding in your setting. Walking is awfully slow! Having a horse is the reason that I had never walked as a pastime – why would I bother when I can be carried! Now I like to walk the tracks that we normally ride so that I really know what I am asking of her – some of those hills are petty steep – great training for the Frances route! 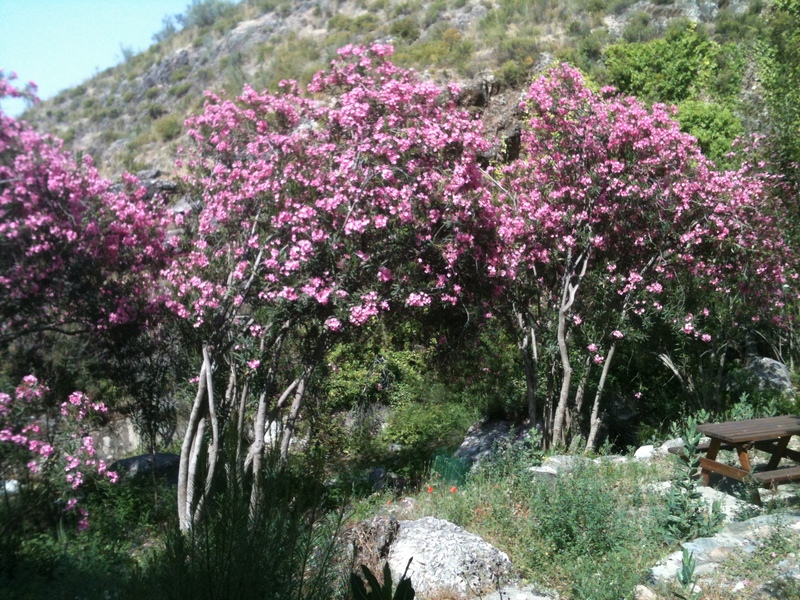 Yes the pink blossoming trees are oleander – I think animals must have an inbuilt knowledge of what is bad for them. Liana never even so much as looks at them, whereas she will make a grab for practically everything else that she passes. Fire is terrifying. Glad to hear you were spared but feel bad for others’ destruction. Both your animals are gorgeous. What grand views you have and lots of open country to ride in. Awesome. Hi Tess. 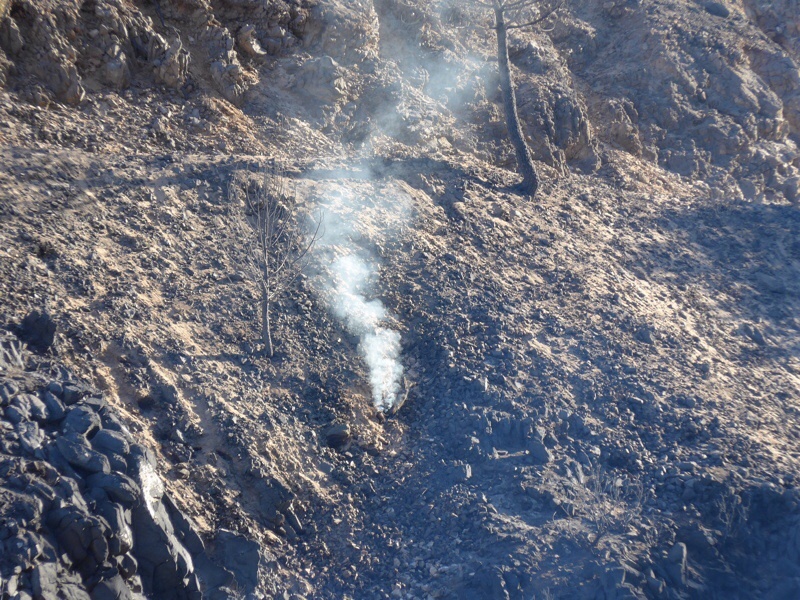 The fire investigators reported today that the fire was intentionally started. I can’t begin to imagine what drives someone to do that. So many lives at risk. Apparently arson is the cause of most fires. How very sad!